Our attorneys personally handle every personal injury, medical malpractice and workers' compensation claim our law firm takes on. 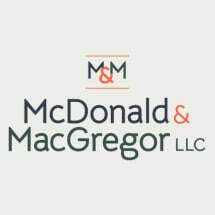 Based in Scranton, McDonald & MacGregor, LLC (M&M Law), is renowned for obtaining record settlements and jury verdicts in Northeastern Pennsylvania. Attorneys Michael P. McDonald and Malcolm L. MacGregor each bring over 25 years of experience to the complex injury cases we handle. Both attorneys are leaders in the regional legal community, mentor other lawyers and handle referral cases on a regular basis. Our firm is also dedicated to giving back to our communities, primarily in Scranton and Wilkes-Barre, but broadening our reach every year. We take on pro bono work, sponsor many community events and coach youth athletic teams. We are a team of doers and givers. If you or a loved one has suffered a serious personal injury due to the negligence of another person or entity, we would like to speak with you about your legal options and rights. We advocate aggressively for victims and their families, putting a wealth of resources and legal skills to work to maximize compensation for medical bills, lost wages, pain and suffering, disability, property damages and much more. At McDonald & MacGregor, LLC, we hold negligent parties accountable exclusively in personal injury, medical malpractice, workers' compensation and wrongful death cases. We are prepared for the challenges of your case, and we can help you make informed, confident decisions to greatly improve your future.